“Prescription drug use has become the third largest killer of Americans behind heart disease and cancer,” author Gwen Olsen writes. “More than 180,000 people die annually from the effects of legal drugs.” This sobering fact is at the heart of Olsen’s provocative and chilling insider’s look at the pharmaceutical industry, the medical profession, and the government’s failure to provide adequate oversight. For more than fifteen years, Olsen worked as a representative for major drug companies, enthusiastically introducing new drugs to doctors, even though the drugs might lack adequate long-term testing. She says that doctors’ prescription information is sold by pharmacies and tracked by the drug industry, and that reps are handsomely rewarded for sales. “It would take many years and dozens of conscience-altering experiences before I really comprehended the scope of just how much my profession affected the medical industry and the contribution I had made to harming thousands of trusting people,” she writes. The author’s confessions go beyond anger toward the pharmaceutical industry, the high cost of prescriptions, drug advertising, and the willingness of medical doctors to use pills in potentially lethal combinations. Olsen confesses her own drug use, which started in college, and the devastating effect that prescribed drugs had on her when she was depressed. She also confesses the wild dysfunction prevalent for generations in her family, and her struggles to find acceptance, meaning, and good health through taking responsibility for her own well-being. If statistics, case studies, court cases, and scientific data about the dangers of prescription drugs aren’t enough to create a call to action, the heartbreaking story of Olsen’s niece, Meg, should do it. Olsen begins the book with the horror of Meg’s suicide by fire. Meg, a college student, had been given painkillers after an automobile accident, then took ephedra, and the combination gave her manic delusions. Olsen says Meg was later simultaneously prescribed narcotic analgesics, nonsteroidal anti-inflamatory drugs, antidepressants, anxiolytics, antibiotics, muscle relaxants, anticonvulsants, and anti-psychotic meds. She became despondent, dropped out of school, used street drugs, never received therapy, and eventually killed herself. “Compassion is what Meg really needed, not more drugs,” Olsen writes. Olsen’s research underscores her concerns about the wide use of prescription drugs and the devastating effects that can occur. The book is a mix of these reports and her personal observations of children and adults on heavy meds. Instead of asking doctors to prescribe glamorous advertised drugs, patients should be better consumers and ask questions about the clinical trials and side effects, she urges. Well-written and thought-provoking, the book would be better served by a professionally designed cover, an index, and a foreword written by a medical professional to support Olsen’s conclusions. Olsen’s book sounds a wakeup call, especially as the national healthcare debate continues to boil. Reform in the pharmaceutical industry alone could save dollars—and more importantly, lives. 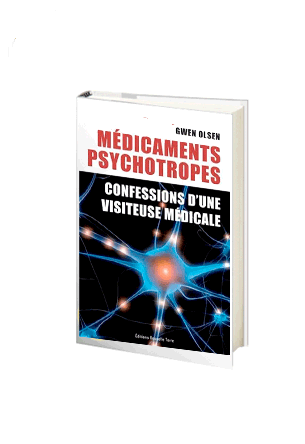 In Confessions of an Rx Drug Pusher, Gwen Olsen brings together the knowledge of an “insider” trained to sell doctors on the merits of pills; the personal experience of having taken psychiatric medications and seen how they altered her life; and the deep grief of having lost her niece—following her treatment with psychiatric medications—to suicide. This book has both an intellectual and emotional punch that readers will long remember. Gwen Olsen is “outing” this massively corrupt industry from a tenured insider’s perspective. She convincingly illustrates everything I’ve known and suspected about Big Pharma’s money-making agendas–and more! This book is a must read! Gwen Olsen is a contemporary hero in the dark ages of a medical model that’s driven by pharmaceutical companies, whose main focus has been profit for self interest, not the health of a culture. This is a time in history where the truth must come forth. 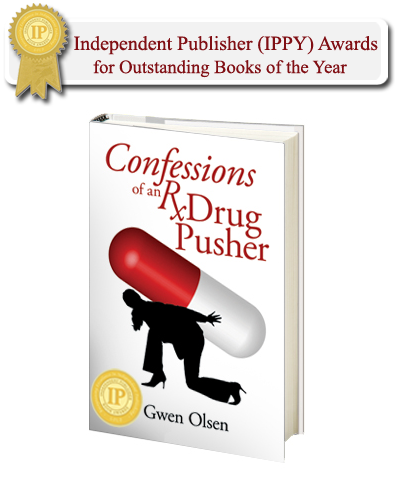 Confessions of an Rx Drug Pusher is one book that will open the eyes of many who really want to know the truth. Joe Dispenza, D.C. Author of Breaking the Habit of Being Yourself: How to Lose Your Mind and Create a New One, and Evolve Your Brain: The Science of Changing Your Mind. It is easy to write off prescription drug deaths, medical errors, and U.S. health care crisis statistics as just numbers. However, they are not. In a well researched, impeccably documented, finely written manner, Gwen Olsen has given us account of the gripping details of real people hurt by the failures of modern health care. A former pharmaceutical representative herself, the information is as credible as it is compelling. It is vital for those currently taking medication for their pain to read and understand this book. I love Gwen Olsen’s book, and I am delighted to have her as an ally in exposing the truth about Big Pharma and biopsychiatry. Confessions of an RX Drug Pusher is a powerful book. Olsen knows her drug facts, she knows the ins and outs of Pharma selling, and she knows the tragedy and pain of personal trauma from the effects of psychiatric drugs. Confessions blends all three and I most highly recommend the book! I just wanted to acknowledge and thank you for your inspiring, passionate, and “compissionate” presentation that you gave on Saturday at Columbine High School in Littleton. Although I have practiced chiropractic for 30 years, I was/am still shocked with the changes that have recently taken place that you so eloquently presented. I feel that most of our so called “health-care” crisis is more of an “unaware” and “distorted perception” crisis. I believe that if most people knew the truth and asked better questions, they would make better decisions and have better results. I salute you in your efforts to awaken peoples minds and their spirits to the truth. Judging by the long lines at your book-signing table, you really resonated with what people are experiencing and needing. My “Aha” moment occurred after I heard you and saw the results on the audience. People need to use their anger, frustration, and confusion and become more self-empowered and take more responsibility for what is happening to them. Confessions of an Rx Drug Pusher is an excellently written book that honestly exposes the many dangers of our modern drugs. I highly recommend it on the merits of verifiable research, including her personal story which led her to a spiritual awakening producing a happier and healthier life without drugs. Thank you for making such a huge impact in our community. Your public presentation here in London Ontario, generated a buzz of excitement in our office, the local newspaper, and in community groups eager to know the truth about today’s medications. Your presentation and book signing drew 140 people … an attendance far beyond our expectations! We continue to receive calls and emails months later from people who attended your talk, purchased your book, and are looking to make changes in their own health, and the health of their community. I am excited to share that I personally know dozens of patients who have made informed decisions about their health through reading your book, bringing information to their physicians, and, in some cases, finding new physicians to work alongside their chiropractors and naturopaths to help them safely get off the deadly medications they were once prescribed. I can not thank you enough for the lives you save. You are an inspiring leader who will impact lives for generations to come. Most people are completely unaware of what really goes on behind the scenes in the world of pharmaceutical sales. If they were, they would be appalled! 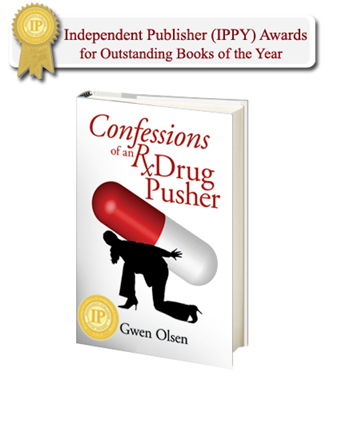 In her book, “Confessions of an Rx Drug Pusher”, Gwen Olsen presents a variety of facts detailing the atrocious state of our nation’s health care system today. She discusses her own personal experience as a rep, coupled with the story of the tragic and unnecessary suicide of her niece. No matter how true or well supported this information is, Big Pharma has deeper pockets than most any individual, which means they usually silence criticism (and critics) before it even begins. Therefore, this is a must read book for anyone who has ever taken a prescription drug! ROBERT MANCIERO, Director of the documentary film PRESCRIPTION: SUICIDE? Thank you so much for making our workshop a huge success. Our patients are still talking about it. When they hear the truth from you, with your background, it really sinks in! I am so grateful to you for not only writing this powerful book, but for putting yourself out there and telling your story. You were quite “compissionate” and it came across. It was a great pleasure having Gwen on my “Green Tea with Marilee” teleseminar. She was the perfect guest expert to cover the topic of “Antidepressants from the Inside Out” with the “Home Spa Lady” Community. Her book and her work offer great hope to people struggling with this issue of searching for the truth about the effects of antidepressants. Thank you, Gwen, for sharing your knowledge and wisdom, and for having the courage to swim against the tide! Wow! Gwen Olsen is a dynamic speaker who captivates her entire audience. Listening to her speak as a former phamaceutical sales representative and hearing that the companies care more about the bottom line than the health and well-being of the customers, was both enlightening and frightening. It’s apparent that neither the regulators, nor the pharmaceutical companies nor most family physicians, are concerned about how prescription drugs really impact the general public. Gwen related how prescription drugs are being treated like an up sale. Instead of being super sized in the restaurant world, the drug companies are using our doctors to say, “Would you like Prozac with that?” She also showed the effects that certain prescription drugs have on our young people and the drastic consequences that are the result. She is a woman on a mission. Everyone needs to hear her story and then help her turn this situation around! This book should be read by everyone! It shows in poignant fashion how our society is being fooled by what is deemed a cure. It takes great courage for Gwen Olsen to reveal the truth and I have the utmost respect for her. Thank you for giving such a rich voice to a plague that affects us all. What an amazing book, what an amazing woman. I had the opportunity not only to read this book but to meet Ms. Olsen. Her book is chock full of examples, citations and proof. Her motivation is beautiful and selfless. Her message is right on. This is excellent reading for anyone who is even considering putting their child on drugs. No one else has the tenacity and willingness to put themselves out their to tell the truth. Kudo’s Ms. Olsen. You have made me even more compissionate! “I’m a former rep and was in the industry for 7 years before I got out and resolved never to get into the industry again, mostly because of some of the same practices and terrible treatment of patients. Gwen did a fine job detailing the demons in the closet of the industry. Hope it helps!” – D. A.
I caught your interviews on youtube.com. You’re well spoken and now well thought of. I think you’re right on target and your message is strong. It is such a shame that you had to suffer to truely understand what we pharma reps were doing. I marketed CNS drugs for a year. In the time I worked in the industry, I was trained on sales and marketing alone and as you said in your interview “trained” to down play side effects. Within a couple of months I fully understood that my purpose was to sell my drug and not to promote patient health. With a sick feeling for taking the hook, I started my hasty exit from the industry for good. I will be looking for your book. I hope your health and welfare is strong, you should be very proud of the work you are now doing. –M.J. I’m also a former Pharma Rep. I’m glad you’re speaking out! It takes guts and you’re saying exactly what goes on in the industry. I was taught the “psych profiling” of physicians too…and other techniques to “drive the core message”. I never felt “okay” about any of it and neither did my colleagues, but the money was good for me and all of us at the time. I’ve moved on in my career to put my biology degree to better use…thank goodness! –N.H. I have suffered with Gastritis for over a year now. I got Gastritis after an inguinal hernia surgery where I was told that my body experienced some sort of shock and this had affected my stomach. I was prescribed Nexium by my primary doctor, a sample, so I was very grateful for his “generosity”. Well 6 months had gone by and I did not get the results I was expecting from this miracle “healing purple pill” as it is referred to by many. I was in the process of changing careers and was recruited to become a pharmaceutical rep, so I did my homework just to see what I was getting into. One thing stuck out and that was Salary. The money looks great, and I’m sure it was in your case of 15 years in the industry. I did further investigating, resume writing tips from actual reps in the field, preparing for possible interview questions, etc. In one of my YouTube searches for possible interview scenarios I typed “Pharmaceutical Reps” and got your video “Ex-Pharmaceutical Rep. Speaks Out” which has since put me on an interesting path in life. Basically, I got off of Nexium and have started juicing and drinking high grade health beverages packed with antioxidants. I feel amazing, have no symptoms associated with Gastritis which was a surprise to my doctor after he had mentioned prior to giving me Nexium that I’d be living with this my entire life. So, if it wasn’t for you who knows where I would be or what other meds I’d be taking. –K. H.
I’ve been a pharmacist since 1971 and I vividly recall a conversation I once had with a drug salesman (called detail man at the time). He explained that his goal was to sell a certain number of dollars worth of one particular drug. He stated that he didn’t care whether he sold one pill or a million, as long as the price worked out to his goal. That conversation has stuck with me for over two decades because it was at that moment that I first realized my perception of the drug companies was far different from what people in that industry believed. Perhaps I was naive, but during pharmacy school and years of work at a large county hospital, I found that I actually believed my profession was honorable and that I was part of a giant team focused on helping people be healthy and get well when illness struck. This was surely the ideal in school, and I assumed things actually operated that way. Gwen Olsen’s book is exactly as the title says, a CONFESSION. She has done a clear, masterful job describing how she unwittingly lived through the horrors of a harmful, dysfunctional family and found herself enmeshed in an industry where she was expected to make sales at any cost. Concern for an ill person was not part of her work paradigm. The author not only lived through the personal and business issues but exited from both, apparently still intact. After my first reading of “Confessions of an Rx Drug Pusher”, I described it to friends as terrifying and almost sickening. That description remains valid. More important than the story is the reports of experience, learning, and growth that shaped this author into a perfect spokesperson for all of us who find ourselves in direct opposition to the antics of the drug companies. If I hadn’t had direct experience with the issues Olsen describes in her book, I might think she was engaged in fiction, not reporting fact. Sadly, she’s right on track. Her tale is still terrifying, but you should read it – maybe more than once. You may begin to understand that it has never been the intent of any drug maker to improve health. Instead, their goal has always been to maximize profits at the expense of health. 5 out of 5 stars: “A realistic and honest book about the dangers of prescribed medications” By Charlie – former pharmaceutical researcher. Finally a very honest and genuine account of the reality of the drug industry. Gwen Olsen takes you through a personal journey of a Pharma sales rep with glimpses into the harsh reality of how the pharmaceutical industry operates. In this account, Gwen courageously talks about the suicide of her niece and the effects that prescribed medication may have had on bringing about this tragedy. Her work is scrupulously researched and very balanced as she tries to find answers to the events that led to the death of her young niece. At the same time she begins to question her work as a “drug salesman” and begins to question the ethos of the health care system. Could the same drugs that she had been selling be harmful to the brain chemistry of people, perhaps permanently? Olsen gives a balanced view of the factors that led to the violent suicide of this young soul. It is not an attack on the pharmaceutical industry, but an honest account by someone who is brave enough to have broken away from what was a lucrative career in order to find truth. Having left pharmaceutical research myself, for reasons similar to what Olsen describes, I can relate very closely to what she says. Now, working in clinical practice, I see the devastating effects that prescribed medicines can cause. This is a book that I will be recommending to many patients that come through my door. 5 out of 5 stars by Dawn Marie Roeder author of It Doesn’t End Here: An Amazing Journey of Faith and Forgiveness. Thank you Gwen Olsen for writing this powerful expose and first hand account on what can happen in an industry when it is fueled by greed and empowered by a system that is supposed to be its watchdog. As she notes of Albert Einstein’s quote in the beginning of Chapter 13, “The world is a dangerous place, not because of those who do evil, but because of those who look on and do nothing.” Gwen has chosen to do something by writing this book, taking her 15 years of experience as a pharmaceutical representative, and now advocating on behalf of others by courageously educating the public on the ins and outs of a dangerous system gone awry. As awareness is the first step in bringing about positive change, Gwen Olsen is on the forefront of bringing that change about. 5 out of 5 stars: “A Great Exposure – Just Truth” By Ray S. Phipps “Book mark” “Confessions of a RX Drug Pusher” is a captivating and well documented exposure of trends in our current “drug” culture. Our experiences can only verify the facts of this book. Events related herein are repeated day after day but our society is bent on treating symptoms rather than dealing effectively with the causes. May parents, loved ones and friends, be so kind as to face the truth and save the lives, literally and figuratively, of those we love. Humanity will be well served to “wake up and smell the roses” as the author of this book admonishes. 5 out of 5 stars: “Life changing! Eye Opening!” By Jennifer Lutterbie (Ormond Beach, Florida, United States). “Confessions of an Rx Drug Pusher” (Paperback). This honest account by Gwen Olsen brought hope and answers! The puzzling questions of what happens to people on these drugs, the effects and the hazards. I have recommended (and bought it) for several people and the opinion is this is a must read for anyone on or contemplating taking SSRIs, how big PHarma has hood winked the public, and the very real dangers of the anti-depressant world (why we are seeing violence and suicides escalating). I am so sorry for your loss and I thank you Gwen Olsen for your courage!